Almost all of us carry a camera these days–the smartphone in our pocket, the tablet in our purse, the digital SLR hanging around our neck–and we love to snap away and share our favorite photography with our friends. But like just about anything in life, a little planning can produce much, much better photos. Use these photography tips from local pros to help you capture better photos during your next visit. The conventional wisdom is that good timing or “being in the right place at the right time” is the most important trait a photographer can possess. Timing is important, but so is preparation. Thankfully, “the right place at the right time” describes just about any locale or hour of the day in Pacific County. Sunrise on Willapa Bay? Excellent. Afternoon in Oysterville? Hard to beat! Evening at the Port of Ilwaco? Perfect. 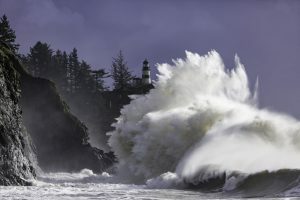 Giant waves and Cape Disappointment Lighthouse are staples of a great Waikiki Beach photo, like this one from local photographer Richard Dawson that highlights the Rule of Thirds. Few areas of southwestern Washington have been more-often photographed than Waikiki Beach in Cape Disappointment State Park. Spectacular crashing waves, a striped, 150-year-old lighthouse in the background, hulking driftwood – this shot has it all, and the best photos fit everything into one frame. This photo from local photographer Richard Dawson illustrates the Rule of Thirds: if the photo were broken into three vertical panes, the cliff would fill the first pane, the lighthouse the second and the wave the third. Now lay three horizontal panes over the vertical panes so a nine-box grid is formed – this should help you visualize the Rule of Thirds. Visiting photographer Emily Ashmore capitalized on overcast skies during a stay on the Long Beach Peninsula. 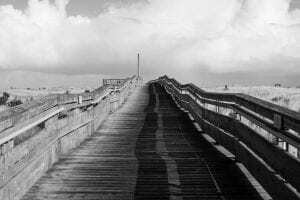 Shadows, lines and details pop in this black and white photo of the Discovery Trail’s elevated boardwalk. Sunshine isn’t always a given in the Pacific Northwest, but photographers can use the grey skies and morning fog to their advantage. Inland bodies of water lend themselves to moody photography, especially when shot in black and white. Willapa Bay in the early morning or early evening is ideal when the muted blues and greens of the water, hills, and sky nearly blend into a single color palette. Pick a spot on the Nahcotta tidelands or across the bay near the Willapa National Wildlife Refuge depending on the time of day and angle of sunlight. Look for oyster boats or kayakers to add size and space perspectives. 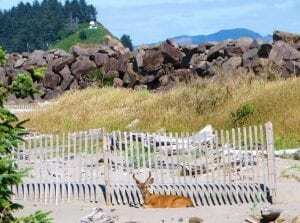 Local photographer Janelle Hux relies on the ‘right place at the right time’ philosophy, which paid off here when Hux captured a young buck relaxing near Waikiki Beach in Cape Disappointment State Park. Remember how we said that good photography isn’t necessarily about being in the right place at the right time? Well, photographing wildlife is often about being in the right place at the right time. Wildlife abounds throughout Pacific County. Large mammal residents include deer, elk, and black bear, while native birds number well into the triple digits. 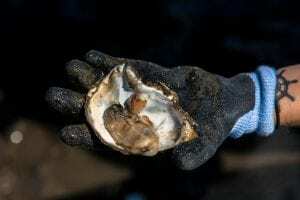 Birders will want to hunker down near bodies of water like Willapa Bay where large birds such as blue herons hunt for small fish and others scour the oyster shells in Nahcotta. 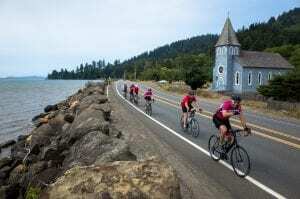 Black Lake in Ilwaco attracts bald eagles, which also frequent the 20-plus miles of beach. Stop by the Visitors Bureau to find out more about birding. Local photographer Janelle Hux is known for her wildlife and scenic captures. Long Beach Peninsula and Pacific County events lend themselves to photography. Think: the Crab Pot Christmas Tree, the Washington State International Kite Festival, or the Cranberrian Fair in Ilwaco. Here’s where you’re trying to capture those special moments – the kids playing in the sand or eating their first oyster or flying a kite on the beach. There’s no wrong way to take these photos. If you like it, you’ve done it correctly. But we can always do better, right? Right. The images above are from local photojournalist and professional photographer, Damian Mulinix. No. 1: Take a step forward and get closer to your subject. Put the emphasis on what you want to show the world. No. 2: Practice selective focusing. Keep a sharp focus on your subject in the foreground, while allowing the background to slightly blur – this will make your subject pop. No. 3: Include people and create layers in the frame. People smile, people frown, people move, people laugh – people make photos more interesting. One of the photos above shot by Mulinix features the historic McGowan Church outside Chinook, a building that’s been shot thousands of times over the years. So what makes Mulinix’s photo interesting? The people and the layers! Look at their faces, their reactions, and the depth of the image – the mountains, the road, the water, the buildings. Make sure you pack a camera next time you head for Washington’s Long Beach Peninsula, regardless of whether it’s next to your raincoat or your beach shorts. Photos allow us to enjoy our favorite memories over and over again. And good photography makes that experience all the more special. Start planning your trip by finding the perfect place to stay! Would you like peninsula updates? Sign up for our monthly newsletter about upcoming events and fun things to do on the peninsula! We never share your email with anyone, and you can opt out anytime by clicking the "unsubscribe" link at the bottom of any email.